Mediations enable amicable settlements. The success rates are high. Mediation procedures are considerably more flexible, quick and cost-effective than court proceedings. The parties themselves have full control at every step of the mediation procedure. In contrast to public court proceedings or arbitration procedures, the parties do not have to fear that any third party takes a decision that goes against their wishes and is perceived as disadvantageous. Moreover, nobody puts pressure on them to enter into a lame compromise. 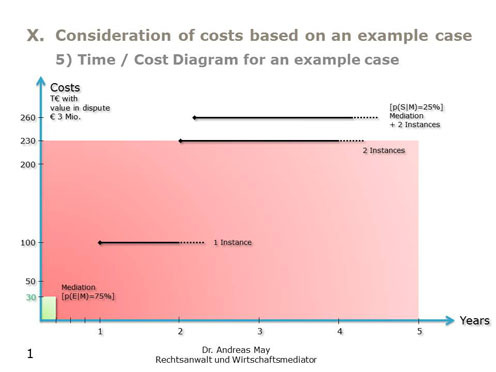 The following time/cost diagram clearly shows that the additional costs and loss of time involved in mediation are very moderate compared to the costs and time involved in court action. The diagram shows an example with a presumed value in dispute of € 3 million. The green area shows the estimated time and costs (hourly rate) of mediation, with a realistic prospect of success of about 75%. The red area shows the clearly higher requirement of time and costs (according to the RVG (Act Governing Lawyers' Fees)/GKG (Court Fee Act)) of court action. The two upper horizontal lines illustrate the difference in total expenditure if mediation is followed by court action. The probability of that happening is low. In case of legal disputes extending over several years, the own legal fees are as a rule considerably higher, because the costs are often not limited to the statutory fees (hourly fees instead of statutory fees according to the RVG). In addition, costs might arise for the taking of evidence. Internal costs of several years of legal action must additionally be factored in. Furthermore, other advantages of mediation have to be considered, in particular the preservation of business relationships, quick clarity/legal certainty and independence from third party decisions. The advantages outweigh potential disadvantages, the latter can especially include additional costs and loss of time if mediation fails. However, the additional costs and loss of time possibly involved in mediation are moderate compared to the costs and time involved in litigation. This can be vividly demonstrated by a graphic case study showing the time and cost axes. Moreover, the additional costs and loss of time are incurred only if the mediation fails. Based on the high prospects of success, the chances of a positive outcome of mediation can be classified as higher than that of litigation. Our range of services in mediation is comprehensive. Depending on the nature of the case and mandate, we either act as mediators or as a mediating lawyers. As mediators we act in the role of a neutral intermediaries in commercial law conflicts. The vast majority of the mediation procedures we conducted ended successfully, which means that with our support, but on their own responsibility, the parties could find an amicable solution. Successful mediation procedures have a highly satisfying effect, not only because a legal dispute could be prevented, but also because as a rule they are more considerate of relationships, can reduce misunderstandings and communication difficulties, and can establish mutual trust. As mediating lawyers we safeguard the interests of one party. The mediating lawyer is a legal professional specialising in mediation. The double qualification as commercial lawyers and mediation experts is essential for this role. As mediating lawyers, wetake the leading role in rendering advice in conflict situations or contribute our mediation competence to a team of lawyers. Clients wish to be advised and supported by their lawyers to the greatest possible extent. Mediation requires the skills of a conflict manager who also considers the psychological and communicative aspects and knows the course of an alternative dispute resolution procedure. Mediating lawyers have the experience and competence to fulfil the tasks of a conflict manager involved in mediation. Attempts at finding an agreement within the scope of a mediation procedure are (even more) promising when the parties are accompanied by mediating lawyers (in this respect see May, NJW-aktuell 31/2014, 14; May, NZBau 2014, 334; May/Hartung, NJW-aktuell 5/2014, 12).